The five bones that form the palm of the hand and connect to each digit. The five cylindrical bones closest to the metacarpals that connect the five digits to the palm. The five cylindrical bones that form the tips of the fingers and thumb. The base knuckle joints that connect the metacarpal bones to the proximal phalanges. The middle knuckle joints that connect the proximal phalanges to the middle phalanges. The top knuckle joints that connect the middle phalanges to the distal phalanges. 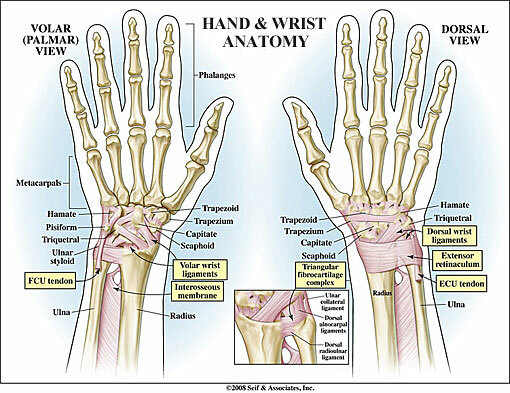 Ligaments found on each side of each joint on the fingers and thumb that serve to prevent abnormal sideways bending. A strong ligament that connects the proximal to the middle phalanges on the palmar side of every joint of the hand and protects the fingers from hyperextension. A broad sheet of interconnected tendons most prominent at the metacarpal-phalangeal joint of the finger that helps straighten the proximal, middle and distal phalanges. The small muscles of the hand that serve to position and hold fingers steady during fine-tuned activity such as spreading the fingers. The muscles that form the spongy pad right below the thumb whose main function is opposition. The brachial plexus is the nerve center at the root of the neck and shoulder which is comprised of portions of the nerve roots originating from the cervical spinal cord. This group of nerves criss-crosses and branches and supplies the muscles of the back of the shoulder, chest and the entire upper extremity to the fingertips. The artery that travels near the ulnar nerve into the pinky side of the hand and joins the radial artery in the palm to provide blood to the front of the hand and fingers with branches spreading dorsally. The artery that travels across the front of the wrist on the thumb side of the hand and joins the ulnar artery in the palm to provide blood to the front of the hand and fingers with branches spreading dorsally. Learn more about ligament injuries of the hand.